Combine the farro and water in a large, heavy bottomed pot with a pinch of salt. Bring to a boil, cover and simmer over low heat for about 45 minutes. Let it sit for 5 minutes with out lifting the lid. Set aside. Lay eggplant, squash and tomatoes on a baking sheet and drizzle with the oil and salt. Toss to coat, then make sure that the tomatoes are sitting cut side up, and everything is in a single layer. Roast for 30 minutes, until browned. Meanwhile make the pesto. Combine everything but the oil in the bowl of your food processor and puree. Drizzle in some oil, with the machine still running, until it comes together in a paste. You may have to stop and scrape the sides of the work bowl. 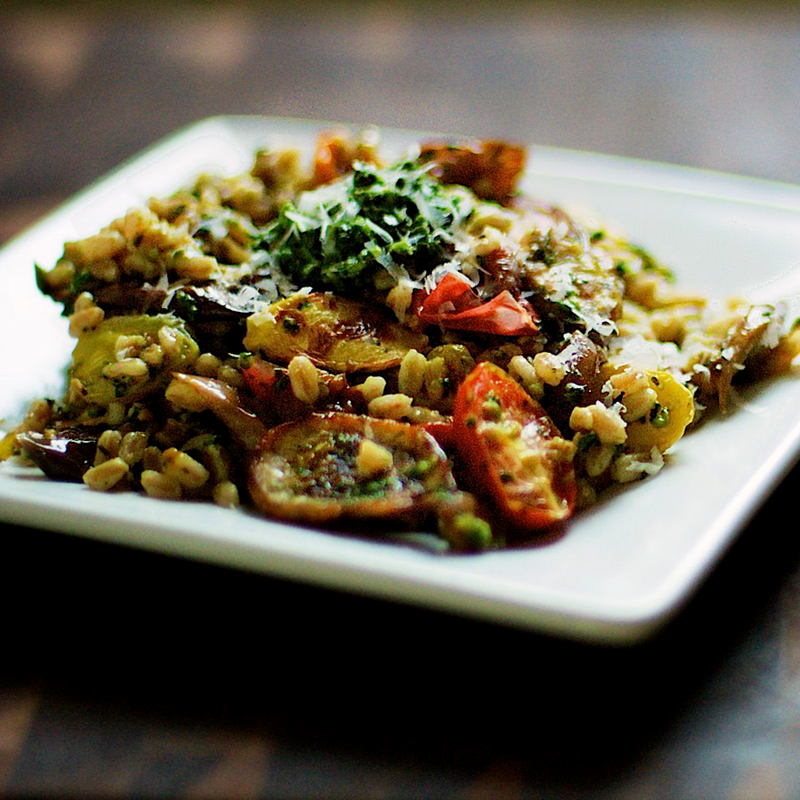 To serve, gently toss the roasted veggies with the farro. Stir in about half of the pesto. Serve with a small dollop of pesto and cheese on top. You probably won’t use all the pesto, but it tastes great on everything. This anti-cancer recipe was generously contributed by greens and seeds.